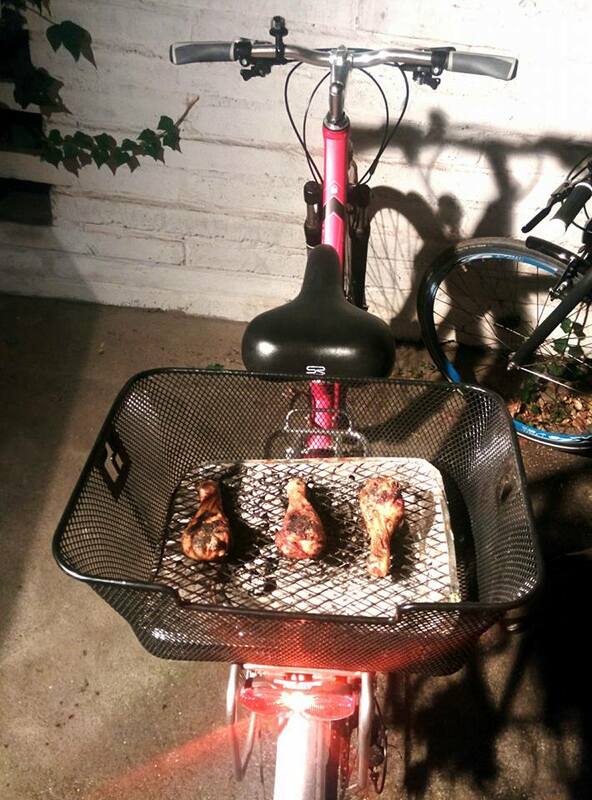 You can even use a basket to carry home the rest of your BBQ. After this we renamed my bike the Braaicycle. Only South Africans will get this! Unlike many Europeans who have been riding their bicycles around cities since they were yea high, those of us from other continents often have to learn about city biking the hard way. I wobbled off on my first bicycle in Berlin not having ridden a bicycle since childhood, and never in a city. Not that cycling isn’t big in South Africa – sports cycling and mountain biking are common, and there are two big international races held there, the Cape epic (a mountain bike race) and the Argus cycle tour (a road race). But until recently there were not many cycling lanes in the city and cycling as a means of public transportation was not that common. 2) How to pump up tires. The foot pump works much better, if you can pump the tires at home. But it’s good to have a hand pump around in case your tires need pumping while you’re out. Unscrew the little knobbie thingie on your tire, attach the pump and prepare to do some strenuous work to get some air inside those tires. Ok I admit, J normally pumps up my tires. 3) Now and then your chain needs oil. When your bike starts behaving like it’s tired, it’s probably then. 4) In the cycle lanes, keep right unless you are overtaking (in a country that drives on the right). Otherwise you will get in the way of faster cyclists. If you hear someone behind you ringing their bell at you, they probably want you to move over to the right so that they can pass (or are just letting you know that they will be coming past soon so you don’t decide to go to the left side of the lane to overtake someone else). Tour groups who take up the whole cycle lane (and part of the road) are super annoying as not only do they hog the whole lane, they ride very slowly while doing that. 5) Keep a good enough following distance from the bike ahead of you. Sometimes they stop suddenly or crash and you don’t want to ride into them. A girl once crashed directly in front of the cyclist in front of me, who then stopped dead in front of me, and I was only just able to stop in time. 6) Take your bike for servicing in winter, in summer the waiting time is longer. At least that’s what they tell me. And buy a bike in winter, it can be cheaper because in spring there is suddenly a rush to buy bikes. 7) Riding in bad (rainy) weather is great in a way because you have the whole cycling lane to yourself. As soon as there is good weather it gets really crowded. Be careful of icy bike lanes after it snows though. I only tried riding once after it had snowed, and there was a lot of ice in the cycle lane, everyone was falling off their bikes. The worst thing you can do is brake as that’s when you fall. It was better to slowly slide over the ice like on ice skates (that said, I won’t be riding after snow again). 8) Have good lights. A white one in front and a red one at the back. This is not only much safer, it is required by law. Especially in winter when it’s darker, you will feel very unsafe without bright lights. Reflectors are also required. They also sell reflective sticks that you can clip onto your wheel spokes so that cars will see you from the side if you or they are turning. 9) Wind is horrible for cycling. Glasses help. If you suddenly start feeling like you’re very unfit or that your tires are flat, you might be just be cycling into the wind! Wind makes getting anywhere double the effort and if it’s strong enough it even blows your bike sideways. It also blows things into your eyes, especially if it’s spring and there are falling flowers all over the place, or you’re near a building site with sand (lots of those in Berlin), or it’s autumn and the leaves are falling or…ok, anytime is a good time to wear sunglasses when you are on your bike. Since sometimes I want to wear sunglasses to protect my eyes even when it’s not sunny and bright, I bought a pair of lightly tinted ones that act as a protection but don’t make it too dark. These have been a great help and I wear them all the time now. On countryside rides they are also great protection against the little insects that come out at dusk. 10) Watch out for car doors opening if you are riding past parked cars. Rather keep a distance. I’ve heard of quite a few people being “car doored” (it happened to a colleague who had a massively bruised face and eye) and it knocks you right off your bike and can do serious damage. 11) Helmets are safer. Not many people wear a helmet when cycling in Berlin, probably because there are many off the road cycle lanes, but obviously it is safer if you’re spending a lot of time in traffic or riding fast. In some countries it is required by law (in Germany it’s only required by law up to the age of 13). 12) Obeying traffic rules makes life easier for everyone. The people driving through red lights often obstruct traffic and make things difficult for everybody, as cars then learn to dislike and disrespect bikes. There’s nothing more annoying than those people who ride super slowly and in the middle of the cycle lane, then after you finally manage to overtake them and are stopped at a red light, they inevitably slowly cycle past you through the red light so that you can stuck behind them again. I’m not sure why there’s such a correlation between cycling super slowly and not stopping at red lights. In Germany, yield to cars/bicycles on your right hand side, unless you are on the main road. If there is a cycling lane, you are supposed to ride in it and not in the road where you will slow down the cars. Use hand signals (raise a hand left or right) to show if you are about to turn or move into the left side of the lane to overtake someone (there might be someone behind you and this way they won’t ride into you). 13) You can get a fine for riding on the pavement (unless you are under 10!) – I’ve seen it happen to someone. That said, if it’s a cobblestone road and you ride slowly on the pavement and give right of way to pedestrians then people are usually understanding (riding on cobblestones is very uncomfortable!). The same for when there’s a road where cars are speeding and there’s no cycle lane, most people do not mind as long as you are considerate of pedestrians. 15) Beware the cyclist wearing headphones. They are a menace because they don’t hear you coming or ringing your bell. You don’t see many people doing it as it’s actually illegal and you get a fine. Those talking on cellphones while cycling (which is probably also illegal) are also annoying as they slow down and stray towards the middle of the cycle lane because they’re not paying attention. 16) Take spare inner tubes with you for your tires if you’re going for a long bike ride, because it’s quite common to get flats (some tools for taking off the wheel are also useful). On long bike rides I’ve been on in a larger group, we’ve averaged 2-3 flats per ride. It’s possible to put some special tape inside your tire that reduces the chance of a flat tire. You can also get more expensive tires that do not puncture as easily. 17) Watch out for glass in the cycle lane, sometimes people break beer bottles and the shards stay in the cycle lane and can cause flats. 18) Have damage insurance if you live in Germany. One of the first things I was told when I moved here was that if you cause an accident while on your bike, you will be responsible for any damages to the car (or people). Damage insurance is an important German insurance for accidental damage of all kinds and the bank provides it so it’s easy to obtain. 19) A back pedal braking function is great. My old bike had this (some city bikes do) and it was especially helpful when it was raining and the roads were wet, as the bike braked much better this way than with conventional brakes. It was also helpful when my normal brakes failed one day while I was cycling along…! 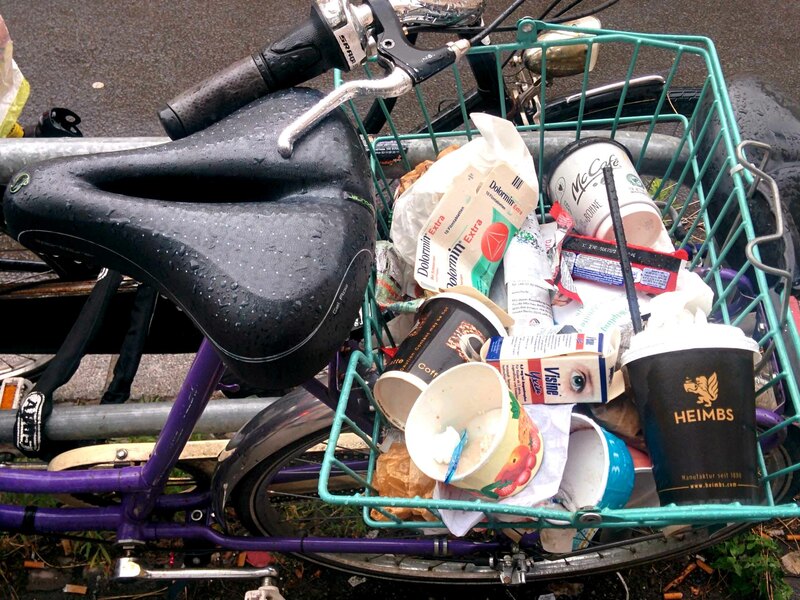 20) A big basket is an amazingly useful thing to add to a bike. Everything goes in there now, including J’s stuff. When biking long distances it’s also much more comfortable to put your bag in there instead of on your back. You can also buy side bags for the back of the bicycle, city bikes and trekking bikes have a place to attach them. 21) A chain cover really helps to stop your trousers getting stuck in the chain. I found this out when my chain cover broke one day and I had to rip it off completely. Until I bought a new one I was constantly getting the bottom of my jeans stuck in the chain (I understand why skinny jeans are so popular in Berlin now) and ending up with dirty, oily jeans. 23) Buy a good bike lock for your bike, or buy a bike that nobody wants, like my previous one. Bike theft is rife in Berlin. As a friend found out, when you start to fill the form to report a crime online, the first option that pops up for selection is bike theft. Bike locks come with safety ratings, although a friend had a lock rated as secure and his bike was still stolen. Also don’t attach it to a short pole as I once did (J then “stole it” and put it inside, as in his words, I locked it so badly that a child could have stolen it). The thieves will simply lift the bike up and take the bike and chain with it. Also don’t lock it to a wheel that can be removed or underneath the saddle where they can just take off the saddle. The lock should be around a part of the frame of the bike where it can not be pulled off by removing some part of the bike. People also steal wheels, so you can also put the lock through part of the bike AND the wheel. They also steal bike lights, so if yours are detachable and you park it on the street you might want to remove them. 25) Biking is one of the best ways to get around Berlin. 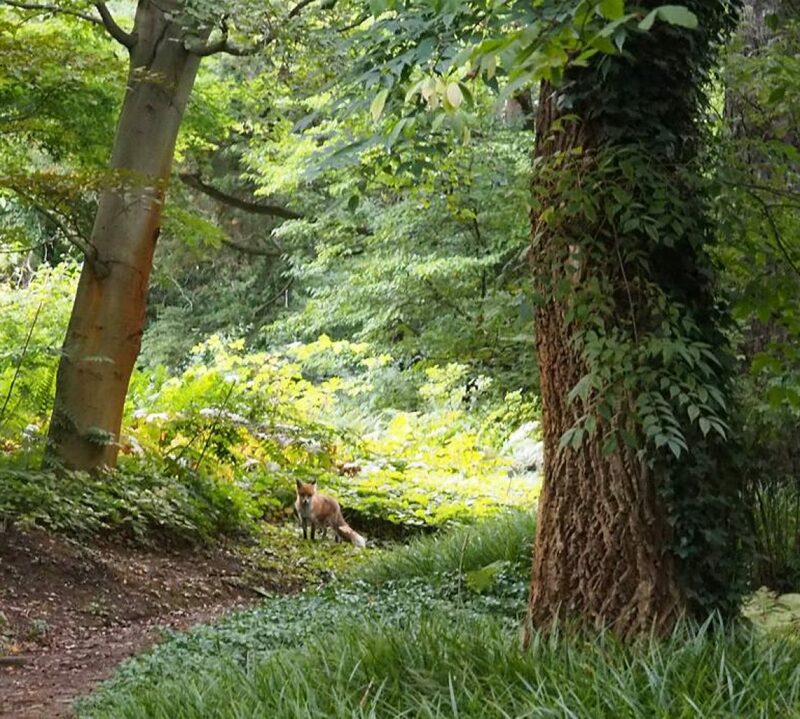 It’s good exercise, you get some fresh air, it’s better (and cheaper) than being stuck inside crowded trams, trains or buses and sometimes it’s even quicker.